The text used is the edition of Hultsch (1876), but I have also consulted printings of Commandino’s translation (1588 and 1602). Book III of the Collection of Pappus the Alexandrian, and it contains plane and solid geometrical problems. §1 Those who wish to determine more artfully things sought in geometry, most noble Pandrosion, deemed it right to call a problem [(something proposed)], that for which it is proposed to make and to construct something, and a theorem that in which when certain things are suppposed, what follows them and what altogether consequent on it is observed, with some of the ancients saying that all are problems, and others theorems. And so, someone putting forward the theorem, after detecting in whatever way what follows this, might consider it proper to seek it and would not sanely put it forword in any other way, while someone putting forward the problem, [if he is ignorant and an idiot,]1 even if he prescribes what somehow cannot be constructed, is forgiveable and not accountable. For it is the job of someone investigating also to determine this, what’s possible and what’s impossible, and if possible, when and how and in how many ways it is possible. But if someone laying claim to mathematics is proposing without any experience, he is not outside guilt. Well then, some of those recently, through you, laying claim to know mathematics have, ignorantly to us, determined the statements of problems. We are required to state some demonstrations about them and things near to them for your gain and for the gain of lovers of learning in this, the third book of the collection. And so, someone with a reputation for being a great geometer ignorantly determined the first of the problems. For given two lines he claimed that he know how to get two means proportionally in continuous proportion through a plane investigation and the man even considered it proper for us, after examining it, to give a response about the construction that he brought about, which goes like this. 1. Hultsch suspects this clause as an interpolation, and not implausibly. It could well have been a scholion by someone who did not understand that Pappus is allowing that search for problems can involve finding out that the construction is impossible. Afterwards, it crept into the text. A false solution (as one might expect, it is obscurely complicated). (diagram 1 = gen. diag.) §2 1. Let there be two straight-lines, AB, AG, at right angles to one another, and let from B a parallel to AG be drawn, BD, and let BD be posited equal to AB, and let DG be joined, and let it fall together with BA at E, and letfrom E a parallel to AG be drawn be drawn, EQ, and let from D a parallel to BE be drawn, DH, and let DN, NL, LX, XK be posited equal to BD, and letthrough points N, L, X, K parallels to BE be drawn, NO, LM, XP, KQ, and let KR be posited equal to BA, and let KR be bisected at S, and as KQ to QS, so SQ to QU, but as SQ to QU, so QU to QF, and let an equal, CX, to AB be taken from XP, and let CK and CF be joined, and from S, parallel to CF, i.e., SY and from Y a parallel to KX, i.e., YW, and let as LM to MW, so WM to MA', and as WM to MA', so A'M to MB', and let an equal to AB, i.e., NG', be taken away from ON. And let G'L be joined, and G'B'. And let from W a parallel to B'G' be drawn, WD', and from D' a parallel to LN, i.e. D'E', and let it be as DH to HE', so HE' to HZ', and as E'H to HZ’, so Z'H to HQ', and let Q'G be joined, and let parallels to Q'G be drawn, Z'K', E'L' and from K', L' parallels to AG, BD, i.e., K'M', L'N'. To show that M'K', N'L' are proportional means of AG, BD. §3. And so, having written these things, he sent them to us, without even enclosing the demonstration of the proposed problem. But since Hieros, the philosopher, and many others of his friends and acquaintances of mine considered it proper for me to respond at that time about the proposed construction, to make the demonstration that that person had demanded, I have a great deal at present to say, that it is not as required, but he ignorantly uses the construction. For having bisected straight-line RK at S and having made as straight-line KQ to QS, so QS to QT, he also made TQ to QF in the same ratio. There is every necessity, not for that man nor for us, to find the point of the section of the third ratio as F. With such a difficulty following along with his guilt, he reveals himself as not detecting what follows. §4-13: I omit Pappus extensive analysis of what goes wrong. §14-18: Pappus introduces 5 lemmas on propotion, which are not needed for the double mean proportion problem. §19. 7. And so, these are the things which it was required for me to say in advance, but in allowing you and those who’ve taken exercises in geometry to judge what was written by that man about the construction and things we’ve brought against it, I considered it would be good also to display the opinions of the ancients about the previously mentioned problem and first to say a few things about problems in geometer, taking my start from here. 1 The symptomata or properties of a curve are proportions and equivalences that distances determined by points on the curve to various various fixed lines. So the main symptom of a parabola is that the square on a line drawn parallel to the tangent at the vertex (where a diameter intersects the curve), called ordinate, is equal to the rectangle formed by the part of the diameter cut off by the ordinate (ordered line) and the vertex, called abscissa (cut off line), and some fixed line, called parameter (line to which the abscissa is applied). Every parabola has a main diameter or axis, determined by the sectioning of the cone, where the parameter is the distance from the cut point to the vertex of the cone. However, every parallel to the main diameter is also a diameter. §21 In fact, with such being the difference between problems, the ancient geometers were able, by following the geometrical argument, to establish the previously mentioned problem for two straight-lines as being by nature solid, since it was not easy to describe in a plane the sections of a cone (as it is required given two unequal striaght-lines to get two means proportionally in continuous proportion), but by next wonderfully getting it with instruments for the handwork and construction they drew wsomething fitting-the-purpose, as is possible to see from the treatises produced by them, I mean in the Mesolabe (Mean-getter) of Eratosthenes and the Mechanics or Catapults of Philo and Hero. For although they agree that the problem is solid, they have made merely instrumentally the construction of it, [in agreement with Apollonius of Pera, who also made the analysis of ti through the sections of a cone, and others through the solid loci of Aristaeus, but noone through what are distinctly called planes], and Nicomedes has solved it through a cochloid line, through which he also trisected the angle. 1. The expression in Greek, 'those around A' normally just means A, but it could mean the followers of A.
Hultsch's diagram, as reproduced above, has a trivial error. Can you find it? The commment at the end, whether it is by Pappus or a by someone else, is far from obvious! (diagram 1 = gen. diag.) §24 8 And according to Nicomedes with two given straight-lines, GD, DA, two means in continuity will be taken in this way. 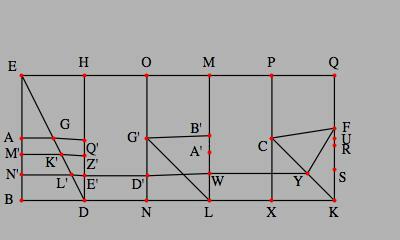 Let parallelogram ABGD be filled out and let each of AB, BG be bisected at points L, E, and let LD, after having been joined, be extended and fall together with GB, that’s been extended, at H, and let EZ be at right-angles to BG, and let GZ be joined, being equal to AL, and let ZH be joined, and a parallel to it, GQ, and there being an angle, that by KGQ, let from Z there be drawn ZQK making QK equal to AL or to GZ (for this was shown as possible through the cochloid line), and let, KD, after having been joined, be extended and fall together with BA, which is extended, at M. I say that it’s as DG to GK, GK to MA and MA to AD. 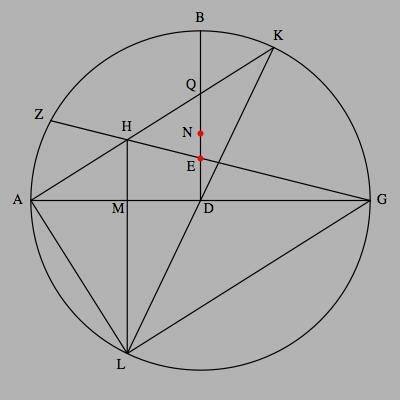 For since BG has been bisected at E and GK is positioned on it, therefore, the rectanble by BKG with the square from GE is equal to that from EK. Let a common be added, that from EZ. Therefore the rectangle by BKG with the squares from KEZ, that is to that from KZ are equal to the squares from KEZ, that is to that from KZ. And since as MA to AB, MD to DK, but as MD to DK, so BG to GK, therefore as MA to AB so too BG to GK. And AL is half of AB, while GH is double BG. Therefore, it will be as MA to AL, so too HG to GK. But as GH to GK, so ZQ to QK due to parallels HZ, GQ. Therefore, componendo, as MA to LA, also ZK to KQ. But AL is also supposed equal to QK (since AL is also equal to GZ). Therefore, MA is also equal to ZK. Therefore the square from MA is equal to that from ZK. Therefore, the square from ML is equal to that from ZK. 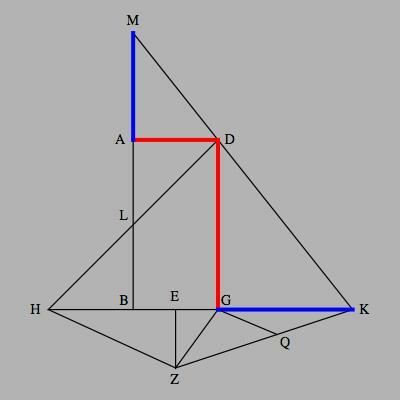 And the rectangle by BMA with the square from LA is equal to that from ML, and the rectangle by BKG with the square from GZ was shown equal to that from ZK, where that from AL is equal to that from GZ (for AL is supposed equal to GZ). Therefore, a remainder, that by BMA, is equal to a remainder, that by BKG. Therefore, as MB to BK, so GK to MA. But as DG to GK, GK to AM. But it’s as MB to BK, also MA to AD. Therefore, as DG to GK, also KG to AM, and MA to AD. §26 For let the given straight-lines be AB, BG positioned at right angles to one another, for which it is required to find two means proportionally. 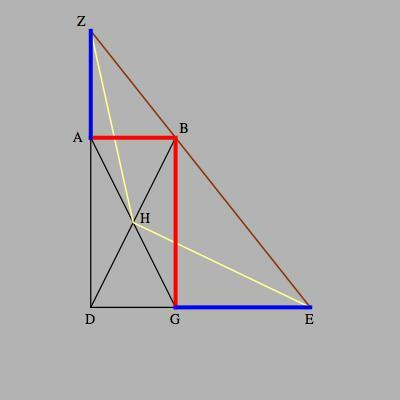 Let the parallelogram be filled out, and let DG, DA be extended and DB, GA joined, and let a ruler be positioned at point B and let it move cutting GE, AZ, until the straight-line drawn from H to section GE becomes equal to the straight-line from H to the section of AZ. Let it come about, and let the positon of the ruler be EBZ, but EH, HZ are equal. And so, I say that AZ, GE are means proportionally of AB, BG. For since the parallelogram is rectangular, the four straight-lines DH, HA, HB, HG are equal to one another. And so, since DH is equal to AH, and HZ has been drawn, therefore, the rectangle by DZA with the square from AH is equal to that from HZ. For the same reasons, in fact, that by DEG with that from GH is also equal to that from HE. And HE, HZ are equal. Therefore, that by DZA with that from AH is also equal to that by DEG with that from GH, where that from GH is equal to that from HA. Therefore, a remainder, that by DEG, is equal to that by DZA. Therefore, as AB to AZ, ZA to GE and GE to GB. Therefore, AZ, GE are means proportionally of AB, BG. 1. The word, δεῖξις, is often translated ‘proof’, but I have avoided translating the verb in this way, ‘show’ instead of ‘prove’. (diagram 1 = gen. diag.) §27 10. Not only is a cube double a cube is found through the supposed instrument also according to us, but also universally having the prescribed ratio. For let there be constructed a semi-circle, ABG, and from center D at right angles, let DB be drawn up, and let some ruler be moved about point A so that one end-point of it moves about with some peg standing at point A, but the remaining part as moving about a center, the pet, between B, G. And with these constructed et it be prescribed to find two cubes having a given ratio to one another. And let the same ratio be made as the ratio, that of BD to DE, and let GE, after being joined, be extended to Z. 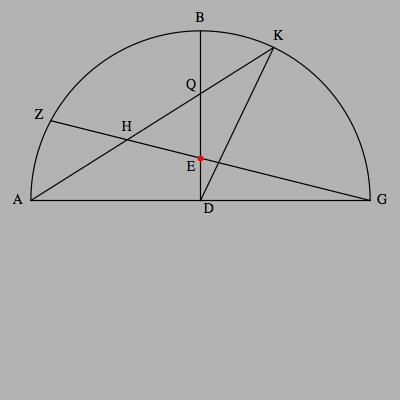 In fact, let the ruler between B, G, be drawn over until the part cut off of between straight-lines ZE, EB becomes equal to that between straight-line BE and circular-arch BKG. For by attempting this repeatedly and shifting the ruler we will easily do this. In fact, let it come about and let it have a position, AHQK, so that HQ, QK are equal. I say that the cube from BD to that from DQ has a ratio, prescribed, that is that of DB to DE. (diagram 1) §27 continued: For let the circle that is filled out be conceived and let KD, after being joined, be extended to L, and letf LH be joined. Therefore it is parallel to BD due to KQ being equal to QH and KD to DL. In fact, let AL and LG also be joined. And so, since a right-angle, that by HAL, is in a semicircle and AM is perpendicular, thereofore, it’s as the square from AM to that from MA, that is GM to MA, so that from AM to that from MH (for as LM to MA, so too MA to MH, so that as that from LM to that from MA, so too that from AM to that from MH, and GM to MA). Let a common be added, a ratio of AM to MH. Therefore, the compound from that of GM to MA and that of AM to MH, that is that of GM to MH, is a ratio that’s the same as that compounded from the square from AM to that from MH and of that from AM to MH. But the compound ratio from the ratio of that from AM to that from MH and the ratio of AM to MH is the same as the ratio which the cube from AM to the cube from MH has. Therefore, the ratio of GM to MH is also the same as the ratio of the cube from AM to the cube from MH. Therefore, the ratio of GM to MH is also the same as the ratio of the ccube from AM to the cube from MH. But as GM to MH so GD to DE, that is BD to DE, but as AM to MH, so AD to DQ, that is DB to AQ. Therefore, as BD to DE, that is as the given ratio, so too the cube from BD to the cube from DQ. And so, if we make as BD to DQ, so too DQ to some other, for example DN, there will be two means of DB, DE proportionally, DQ, DN.